Whilst in London, I went to Tate Britain to see their exhibition on the Romantics. The exhibition blurb claims that it ‘presents Romantic art in Britain, its origins, inspirations and legacies’, and I think it does this well. It’s in the Clore Gallery, where the Turners live, so it’s quite heavy on the Turner. The first room of the exhibition takes six aspects of Romanticism as a broader movement, and illustrates them with appropriate pictures. These aspects are Hopes and Fears, relating to European unrest, for example, and illustrated by some biblical and classical-subject paintings; The Artist’s Life, looking at the myth of the Romantic writer or artist as hero, such as Blake or Constable. The isolation in Turner’s images of ‘Interior of a Prison’, and Blake’s ‘A Vision’ promulgate this vision of the solitary heroic creative genius. The section on Word and Image looks at illustrations, especially Turner’s, though I was disappointed not to see some Blake in this section. Near and Far looks at geographic images, from the Lakes to Italy, while Past, Present, Future sees writers and artists as ‘time-travellers, prophets and moralists’ in which the myth of Albion is central. Finally, Seeing Nature anticipates Pre-Raphaelitism in its interest in the details of the natural world. In this section, Francis Danby’s ‘Romantic Woodland’ seems to sum up a Gothic approach to nature – brooding, remote but slightly threatening; beautiful. 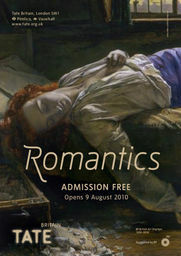 The rest of the exhibition is an ‘imaginary’ Romantics exhibition, featuring paintings which were exhibited and/or popular during the period of Romanticism. It includes a room of early Turner and a room of late Turner; Constable and his contemporaries; Blake (of course); and a collection of more general pictures which give a wonderful feel for Romantic images. Of course this includes Wallis’s Chatterton, which appears on the poster (see above), as well as Etty, Wilkie, Eastlake, Landseer and many more. There are also several paintings by Richard Dadd, including his most famous, ‘The Fairy-Feller’s Master Stroke’. 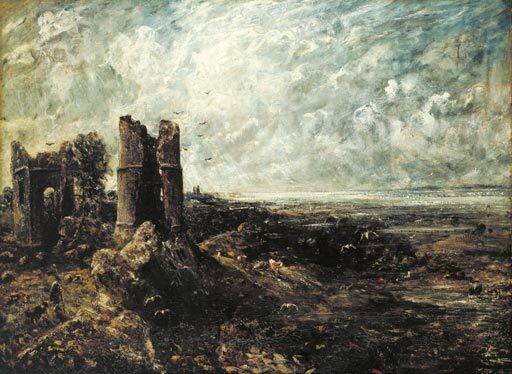 I was particularly struck by Constable’s ‘Sketch for “Hadleigh Castle”‘ (right), which seems, in its gloomy, desolate landscape with ruins and no glimpse of hope, to depict a very Romantic state of mind, closely linked to the Gothic. In fact Constable did this sketch after the death of his wife, so probably was in a rather gloomy state of mind. So much is made of Romanticism as a literary phenomenon (and rightly so), but less, as far as I know, is made of it as a wider state of mind which affected art as well. This exhibition provides wonderful context, and I wouldn’t have missed it for the world. It’s on until July, and it’s free, so do go! Excellent. I think dividing the art objects into six aspects of Romanticism is very sensible, otherwise it looks as if these very diverse artists were all saying the same thing with all their very diverse paintings. But I am not sure why the rest of the exhibition is an ‘imaginary’ Romantics exhibition. If the paintings were actually exhibited and/or popular during the period of Romanticism, then I would call it a ‘true’ reflection of Romantic taste. Yes, the six categories worked very well and gave the viewer something to trace through into the other rooms of the exhibition. I assume the ‘imaginary’ exhibition was because these pictures were never exhibited together at the time, and were chosen to relate to the six themes in the previous room, but as you say, it’s an odd expression.